When you create pages, they are visible by default. A visible page is accessible by all project members, and can be displayed by navigation components on your designs. 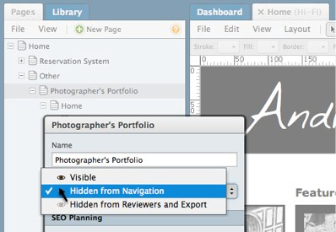 You can change a page’s visibility in order to hide it from Reviewers or prevent it from appearing in your prototype’s navigation. For example, you might want to hide an in-progress page from clients, or hide a landing page from the navigation. 2. Select the page to be configured. Click the page name in the page tree. To select multiple pages, use Ctrl + click (PC) or Cmd + click (Mac). 3. Edit the page visibility properties. Visible – The page is accessible by Reviewers, and it will be automatically displayed by navigation components. By default, each page you create is visible. Hidden from Reviewers and Export – Reviewers cannot access the page, it cannot be displayed by navigation components, and it will not appear in exported versions of your prototype. These pages appear grayed out and with strike-through text in the Page Tree. Hidden from Navigation – The page is accessible by Reviewers, but it must be manually selected to be displayed by navigation components. These pages appear grayed out in the Page Tree. As shown below, the selected page is hidden from navigation. This is because the page is not meant to be automatically included in the navigation. Instead, it is linked to manually from various components within the prototype.